The money-changer quotes you a rate of 4.82 CNY/SGD and you think to yourself, “oh, that seems like a good rate! It is quite near to the rate shown on Google”. You then proceed to exchange your SGD for CNY with this money-changer. Unfortunately, you may have just gotten a poor deal. 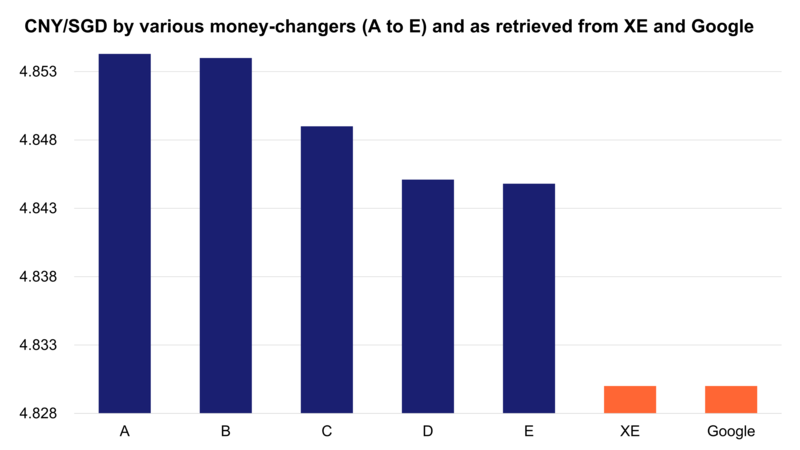 From Jul-17 to Nov-17, many money-changers in Singapore were offering to sell CNY at exchange rates that were better than the interbank or wholesale rates. Wait a minute, how is it possible for money-changers to offer better rates than those shown on Google or XE? You may use the interbank rate as a quick and approximate reference, but not if you want to make precise calculations involving large sums. The chart below shows some exchange rates for CNY/SGD from some money-changers that we gathered in Singapore on the same day we retrieved the rate from Google and XE (Sep-17). These money-changers were offering more CNY per SGD than the rates provided by XE and Google. What are wholesale or interbank exchange rates? What exactly are the rates shown on XE or Google? The rates provided in XE’s free information services are mid-market rates from global currency markets. Likewise, the data for Google’s currency convertor is provided by SIX Financial Information, a Swiss based global provider of financial data. The company aggregates real-time data from worldwide sources, covering major trading venues. These rates are known as wholesale exchange rates. Wholesale exchange rates are the rates used by banks, governments, investment funds and large corporates to exchange currencies with one another. You may also have come across the term interbank exchange rates, which narrows the participants to banks. Now that we know what wholesale and interbank rates are, let’s understand why we shouldn’t use them as a direct comparison. As a consumer, the benchmark rate should be something that can be considered your opportunity cost. Since wholesale or interbank rates are only accessible by banks or large corporates and not to retail consumers, it should not be a factor during the decision-making process. Consumers have no access to these rates, especially not if it’s a retail point-of-sale transaction. Let’s put it this way; if you need to get USD 2,000 in cash, and the best offer rate by a money-changer in the entire Singapore is 5% more expensive than the current interbank rate, did you lose 5%? No, because you do not have access to interbank rates anyway, so it cannot be considered your opportunity cost. Furthermore, the wholesale or interbank rates that consumers see are usually mid-market rates, which is the average of the bid (buy) and ask/offer (sell) rates. The consumer buying or selling foreign currency with a retail money-changer would only look at the bid or ask rate, not the mid-point. Bid or ask rates include profit margins and overheads of the provider, which further exacerbate the difference from mid-market wholesale or interbank rates. So while the retail money-changing rates closely follow wholesale/interbank rates very closely, the demand and supply dynamics can be quite different. Like we’ve observed from the previous example, the rates from money-changers are sometimes better than the mid-market interbank rates. And there is nothing wrong with that; wholesale/interbank markets and money-changing markets are just different markets. What is your true opportunity cost? If not wholesale/interbank rates, what benchmark should you use to assess if you’re getting a good deal from your money-changer? This really depends on your personal objectives and circumstances. Evaluating your opportunity costs in itself is an opportunity cost, but let’s not get too carried away. To truly evaluate if you’re getting a good deal from your money-changer, you should weigh all benefits and costs of each alternative to you as a retail consumer. Here are some possible alternatives (opportunity costs) for a consumer when patronizing a money-changer in Singapore. To be clear, the following are possible alternatives for the settlement of point-of-sale transactions overseas. Thus, remittance or online shopping would not be considered appropriate alternatives. Buying leftover foreign currency from another traveller (not recommended). Assessing fees may be easy, but assessing intangible benefits / costs may not be as straightforward. Is it worth the time and money travelling to a further money-changer with better rates?